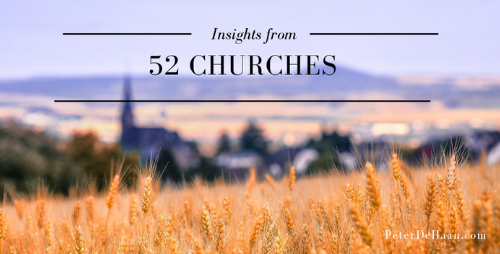 Between last Easter and this Easter, my wife and I visited fifty-two churches. Today marks the end of that adventure but also the beginning of a new one. Our journey is over. I’m sad and excited at the same time. Our spiritual sojourn of fifty-two churches has ended; reunion with our community looms large. We rejoin them for Holy Week, first for Good Friday and then for the Easter celebration. On purpose, I leave my journal at home. There will be no more note taking. Documenting my observations isn’t the point: experience is, community is, family is, and especially God. We sing in jubilant celebration, enjoying community before and after each event. Hugs abound as I reconnect with friends. Both services surpass my expectations, as I enjoy an amazing reunion, encounter a grand celebration, and experience a fitting conclusion to our yearlong pilgrimage. We learned much on our journey and expanded our understanding of worshiping God, but it’s good to be back, home where we belong. Though our trek is complete, writing about it isn’t. Beginning next Monday, I will repost our journey, one church per week, adding new information and providing updates. For those who followed us on our journey, this will be a great recap. While for those who joined us midway through, this will be a chance to follow along from start to finish. As I update and repost, I will also finalize the book that chronicles this awesome adventure. Currently standing at 70,000 words, my posts are only a fraction of what’s in the book. In a couple of months, I’ll be ready to seek an agent and publisher. As they say, stay tuned for more information. Way to go Peter and Candy! I appreciate your encouragement, Jerry, It was quite an adventure!